Frederick Bakewell (29 Sept 1800 – 26 Sept 1869 ) was a physicist credited with improving the facsimile machine invented by Alexander Bain in 1842. Bakewell was born in Wakefield, West Yorkshire, and later lived in Hampstead, Middlesex until the time of his death. Bakewell’s most known invention was the “image telegraph” – in many ways very similar in function to today’s fax machine. 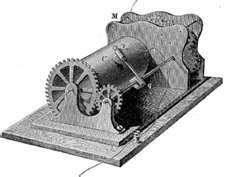 It was an improvement on Alexander Bain’s system, replacing the pendulums with synchronized rotating cylinders. With the image telegraph, the system used a metal stylus with a screw thread traveling across the cylinder as it turned. At the receiver, a similar stylus marked chemically impregnated paper with electric current. Although Bakewell’s machine never became a commercial success, it was an important step before the introduction of Giovanni Caselli’s pantelegraph.